Using common objects found within a culture of mass-production, Tara Donovan creates large-scale sculptures with a mystic quality. 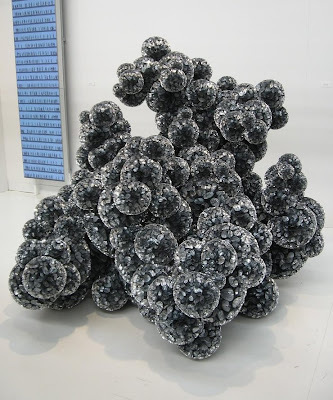 Her use of building pieces through accumulation and detailed assembly of mass quantities, each identical, make her vision all the more interesting. Layered, piled & clustered, these products form new lives of their own. From a far away glance, each sculpture is something natural, like a cloud or an ocean full of waves. As you begin to look closer, you begin to see past the illusion and figure out what each component really is. Toothpicks, buttons, plastic cups, paper plates, and disposable cupcake cups, as seen here, create a phenomenal visual impact. Her use of angles and textured curves amazes me. She creates scenery, as the shadows and lighting creates mountains and valleys, its incredible to see. When it comes to assemblages of a repeated single stroke, Tara Donovan is one of the best artists around.